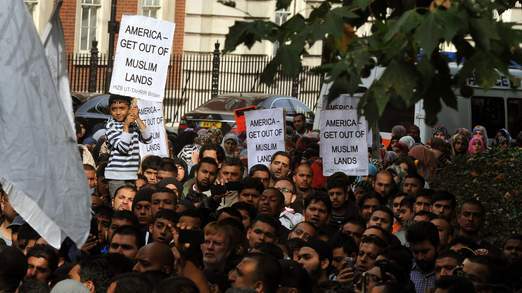 Around 300 people have been protesting outside the US Embassy in London as demonstrations over an American-made anti-Islam film spread across Europe. 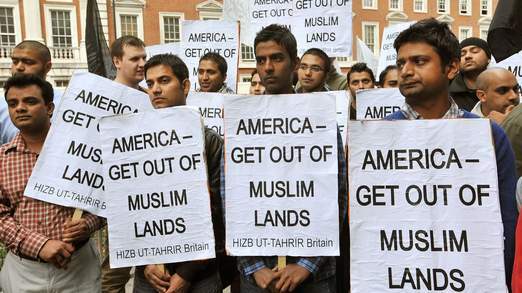 The crowd – many associated with the hardline Hizb ut-Tahrir group – shouted slogans and held placards saying, “America – get out of Muslim lands”. The gathering, mostly men but including some women and children, listened to speakers condemning the controversial film, US foreign policy and “oppression” of Muslims. There was a low-key police presence and protesters were kept within a controlled area by barriers. 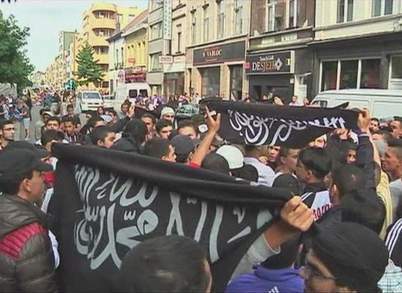 The Conservatives pledged to ban Hizb ut-Tahrir, which has branches in dozens of countries and seeks to establish a unified Islamic caliphate in the Arab world, before the last election. Last year the government’s counter-terrorism watchdog said in a report to parliament that he could see no reason for the group to be banned.